Want us to contact you with more information? Just fill out the form at the bottom of this page! Convenience. We offer in-home lessons, so you can start dinner or catch up on emails while you listen in on lessons from the next room. Creativity. We utilize a variety of games and manipulatives to engage young students in learning music theory. 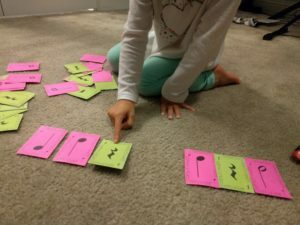 No boring flashcards here! Great Teachers. Corinne had a warm, approachable teaching style that sets reluctant students at ease. We high standards for our students, but we have a lot of fun on the way! Customization. Our approach is not “one size fits all”. Students are encouraged to choose music that they enjoy, as a supplement to a core curriculum. Opportunities. In addition to private lessons, students have access to music theory exams, adjudicated festivals, formal concerts, and “piano parties” (group classes). If you would like to chat with us about our programs, simply fill out the form below. We’ll be in touch! Has the student had previous instruction?